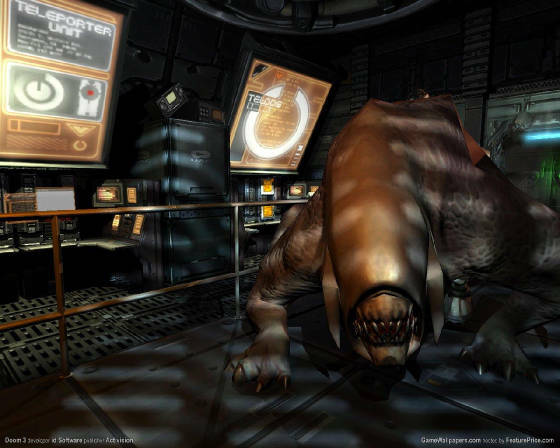 In Doom3 you are a marine,one of earths toughest,hardened in combat and trained for action. Shortly after you report for duty at the Union Aerospace Corporation's Mars research facility, a massive demonic invasion overwhelms the base,leaving chaos,horror and uncertainty in its wake. As one of only a few survivors, you must use overwhelming firepower and all of your combat skill to battlethrough the demonic hordes, Find out what went wrong and prevent the evil from spreading. Only YOU stand between Hell and Earth. In Doom3 like anyother shooter game there are a variety of weapons. Flashlight-Due to the darkness of th UAC facility the flashlight will become your bestfriend. Sadly you cannot attatch the flashlight to a weapon. You are forced to switch between the flashlight and your weapon. Also able to use this as an effective club in close combat. Pistol - a standard marine issue semi-automatic pistol. Highly accurate, and provides solid stopping power without expending too much ammo. Shotgun- The weapon of choice for close combat. 8 shells per clip,but use sparingly on medium and longrange targets. MachineGun- High rate of fire,goodaccuracy,and excellent power makes this a perfect weapon for medium and long range targets. Plasma Rifle- A plasma rifle that uses plasma cells for ammo. A very powerful short - long range weapon. Great accuracy and very effective. Chainsaw- Short range weapon of choice. This weapon is amazingly effective against almost any enemy. There are tons-o-more weapons in this game including the BFG wich of course stand for Big F****ing Gun.